In Game Of Thrones, it is the King’s Hand who exerts some real power of the Seven Kingdoms. His symbol, appropriately enough, was a pin depicting a hand. 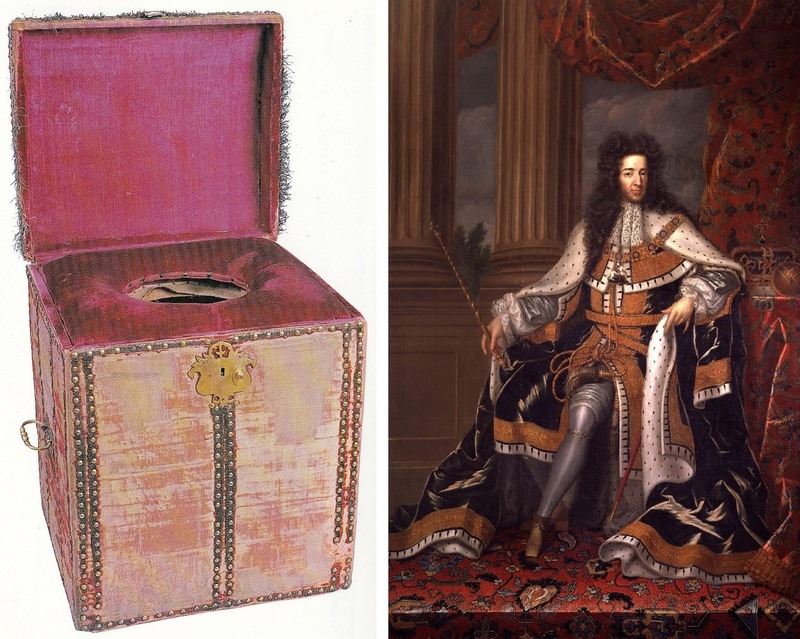 But in yet another example of reality being stranger than fiction, it was the Groom of the Stool—named for the close stool, the king’s 16th-century toilet—who filled a highly coveted position in the royal house. How powerful were they? Well, historians believe that both James I and his successor King Charles I were so swayed by their grooms’ counsel that political discussions of the king’s privy helped fuel the 17th-century English Civil War. As Natalie Zarrelli of Atlas Obscura observes, every day, as the king sat on his padded, velvet-covered close stool, he revealed secrets. He asked for counsel, and could even hear of the personal and political woes of his personal groom, and offer to help. Thereon a fair cushion, the ordure no man to vex. Basin and ewer, and on your shoulder a towel. During the reign of Henry VIII in the 1500s, the king’s closest men of the court were given the title, often as a group. Prestigious gentry and noblemen hung out with the monarch in his privy room, acting as his personal secretaries with his undivided attention while he sat on his close stool. Later kings appointed one person to the task, who would travel with the king and his portable stool if he went on a journey. Only monarchs in exile were denied a Groom of the Stool, though they did get grooms who helped with the general bedchamber. The Groom of the Stool was in charge of all the activities and affairs of the king’s bedchamber and other private rooms; making sure the king was well-dressed and bathed, his bed was made, and even that his personal finances were in order. Sometimes, the grooms had control to spend cash. Before private rooms and privacy became associated with actually being alone, monarchs were surrounded by servants and attendants at all hours of the day, often sleeping in the same room as attendants. Some kings kept their close stool in “more private” rooms than others, but even private rooms would allow a handful of people, with the Groom of the Stool always among them. 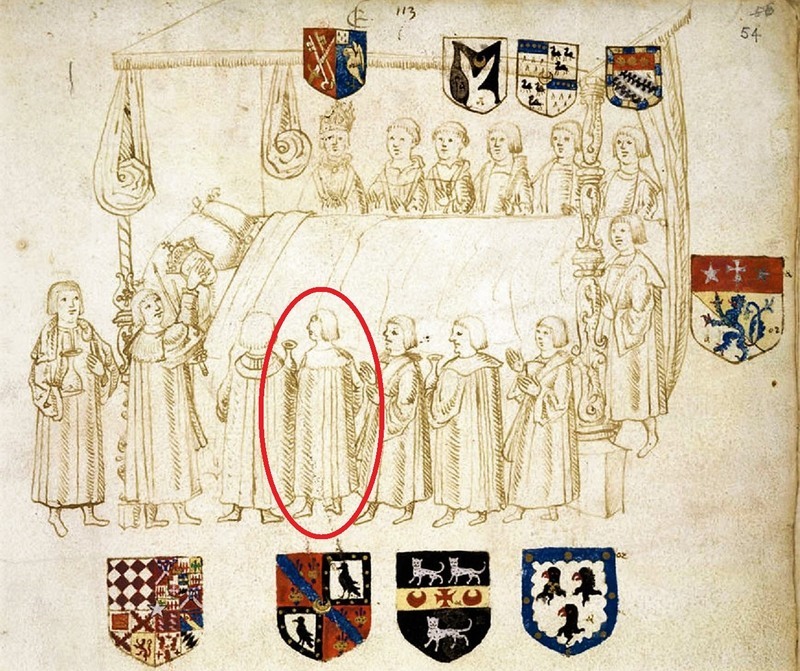 At the deathbed of Henry VIII, with his Groom of the Stool Hugh Denys (circled) one of the chosen attendees. DRAWN BY SIR THOMAS WRIOTHESLEY, GARTER KING OF ARMS/BRITISH LIBRARY. Via Atlas Obscura. Because of this, Grooms of the Stool were often feared by other members of the court. They held highly confidential knowledge about political and personal affairs and, importantly, the king’s ear. Sir Anthony Denny, groom to Henry VIII, was even given the responsibility of Henry VIII’s stamp, which acted as his signature for documents. In the early 17th century, Sir Thomas Erskine was King James I’s captain of the yeoman of the guard, and eagerly combined this job with being Groom of the Stool, which gave him crucial influence over the king. Grooms were sometimes embroiled in other areas of political power, too—Henry VIII’s groom Sir Henry Norris was politically involved with the queen, Anne Boleyn, and was executed along with her after she fell from her husband’s favor. During the mid-1700s, the close stool itself began to fell out of favor. Sir Michael Stanhope for Edward VI was the last to perform the full job; the last Groom of the Stool was technically James Hamilton for the Prince of Wales in the 1800s, though by then the position had shifted to dressing duties, and was renamed “Groom of the Stole” referring to the latin word for clothing, stola. Victorians, it seems, were a little more interested in true privacy. As for the symbol of all this power, it wasn’t a pin of the king’s, erm, you know what. Instead, the Groom of the Stool got a special golden key attached to a blue ribbon. As you might expect, no other copies of this key, which would open the king’s personal rooms, could be made. I am morbidly fascinated by how people dealt with these, er, personal issues in the past. And if you’re writing in a world without modern toilets, toilet paper, menstrual pads, etc., it’s good to have at least *some* understanding of how these things might work. The different expectations of privacy are so hard to get my head (and my writing) around, though. Thanks for feeding my curiosity with yet more details! Hard to imagine that these day. In Highlander (the TV series) the king has a score of men attending him while he tries to do his thing. I was a very odd scene but makes sense now! I don’t think I’d enjoy the job at all. Lol. Despite the obvious perks, that’s one job I might have avoided, Nicholas!